With the rapid development of telecommunications, the demand for cable capacity is stronger more than ever. WDM (Wavelength Division Multiplexing) will be the preferred method to meet the needs. WDM systems are divided into different wavelength patterns, conventional/coarse (CWDM) and dense (DWDM). This post aims to make a comparison between CWDM and DWDM. Wavelength Division Multiplexing is a technology which multiplexes a number of optical carrier signals onto a single optical fiber by using different wavelengths of laser light. This technique enables bidirectional communications over one strand of fiber, as well as multiplication of capacity. A WDM system uses a multiplexer at the transmitter to join the signals together, and a demultiplexer at the receiver to split them apart. With the right type of fiber it is possible to have a device that does both simultaneously, and can function as an optical add-drop multiplexer. CWDM is the technology of choice for cost efficiently transporting large amounts of data traffic in telecoms or enterprise networks. DWDM is an optical technology used to increase bandwidth over existing fiber optic backbones. Channel Numbers: DWDM can fit 40-plus channels into the same frequency range which is twice of CWDM can fit. 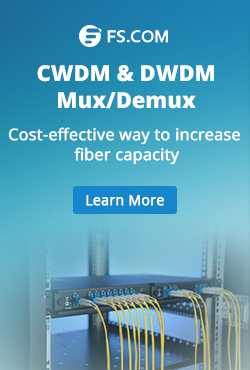 CWDM is used more often than DWDM due to the cost factor. Now that cabling and transmission has become more affordable, DWDM takes place of CWDM. CWDM is defined by wavelengths, while DWDM is defined in terms of frequencies. Modulated laser: Unlike DWDM deploys cooled distributed-feedback (DFB), CWDM is based on uncooled distributed-feedback (DFB) lasers and wide-band optical filters. These technologies provide several advantages to CWDM systems such as lower power dissipation, smaller size, and less cost. The commercial availability of CWDM systems offering these benefits makes the technology a viable alternative to DWDM systems for many metro and access applications. Transmission Distance: Another major difference between the two is that DWDM is designed for longer haul transmission, by keeping the wavelengths tightly packed. It can transmit more data over a significantly larger run of cable with less interference than a comparable CWDM system. If there is a need to transmit the data over a very long range, the DWDM will likely be the priority in terms of functionality of the data transmittal as well as the lessened interference over the longer distances that the wavelengths must travel. CWDM cannot travel long distances because the wavelengths are not amplified, and therefore CWDM is limited in its functionality over longer distances. Typically, CWDM can travel anywhere up to about 100 miles (160 km), while an amplified dense wavelength system can go much further as the signal strength is boosted periodically throughout the run. As a result of the additional cost required to provide signal amplification, the CWDM solution is best for short runs that do not have mission critical data. From the comparison above, we can know both the benefits and drawbacks of CWDM and DWDM. If the transmission distance is short and cost is low, then CWDM may be your first choice. On the contrary, you can consider DWDM. For more information about CWDM and DWMD, you can visit Fiberstore. This entry was posted in WDM Optical Network and tagged CWDM multiplexer, DWDM Multiplexer, WDM on June 19, 2015 by Admin. This entry was posted in WDM Optical Network and tagged CWDM multiplexer, DWDM Multiplexer, WDM multiplexer on January 29, 2015 by Admin. 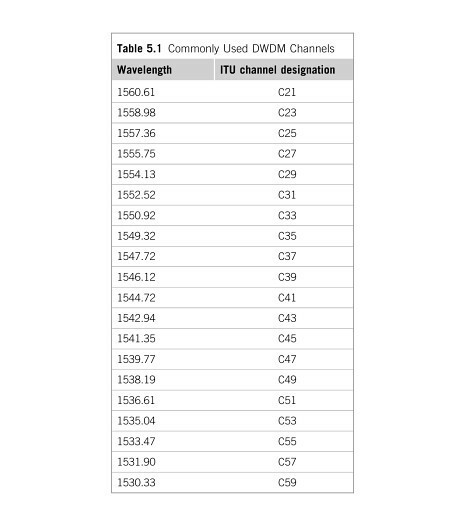 CWDM: An optical industry interim standard uses up to eight wavelengths, this scheme is referred to as coarese wavelengtb division multiplexing(CWDM), in accordance with ITU-T(any channel spacing between 8 and 50 nm). 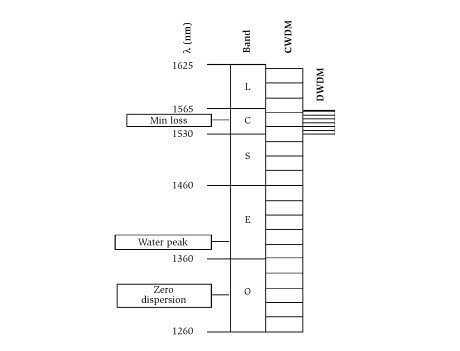 ITU-T Recommendation approved in june 2014, extends this down to 1270 nm(18 wavelengths), anticipating the ready commercial availability of fiber with no “water peak” of loss between the 1310-nm and 1550-nm transmission windows, as discussed in Chapter. Such an extended-wavelength planis, of course, applicable only to nonamplified systems until such time as optical amplifiers with similarly extended bandwidths are developed. A fwe properties are common to all the plans, each with obvious parallels in RF technology. ♦ The closer the wavelengths are spaced, the harder(and more expensive) it is to separate them in the demultiplexers and simultaneously achieve adequate adjacent channel isolation, minimal in-channel flatness variation, and low insertion loss. ♦ The closer the wavelengths are spaced,the more frequency stabillity is required of the transmitters. ♦ The closer the wavelengths are spaced, the better the signal transmission velocities will match. Four-wave mixing and cross-phase modelation are both maxmum when the signals travel at nearly the same velocity. The degree of matching is, of course, also dependent on fiber dispersionm with standard fiber having high dispersion at 1550 nm but low dispersion at 1310 nm. By contrast, close wavelength spacing leads to reduced crosstalk from stimulated Raman scattering. These mechanisms are discussed later. ♦ The more wavelengths that share a fiber, the lower must be the power per wavelength for a given amount of mutual interaction due to nonlinear glass properties. As shown in figure shows the relationship of bands, CWDM channels, and DWDM channels. Gable systems using linear DWDM technology generally use 200-GHz-spaced channels from among the set of 20 listed in Table 1, though a few vendors offer 100GHz spacing. For network designs that use fewer than 20 of the listed wavelengths, various vendors have chosen to offer different subsets. Most offer C21 through C35 as the first eight, but noe vendor offers C39 through C53 as the second eight, another offers C45 through C59, and a third has chosen to offer C37 through C51. 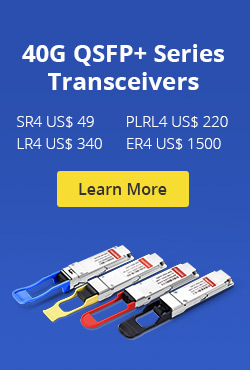 This is obviously inconvenient for operators who wish to have multiple sources for optical transmitters and DWDM Multiplexer. This entry was posted in WDM Optical Network and tagged DWDM channels, DWDM Multiplexer, DWDM Wiki on June 27, 2014 by Admin. 1. The background of the project:Radio and television networks in recent business growth is faster in a given area, is the region development education network access project, due to the previous optical fiber network resources is mainly used in cable television network, optical fiber resources is not so rich, many county to the town had no residual fiber resources, to increase the data business, now want to be in the original on the fiber optic cable TV network transmission using again, plus infomation data signals, or want to lay out the other cable?Is the main work, need to solve as many towns in this area belongs to mountainous area, cable laying is not very convenient, considering various factors such as resources, cost, on the radio and television networks company specialized in optical network access technology co., LTD. Shenzhen Fiberstore CWDM system to conduct a comprehensive performance analysis and product testing.And start in areas such as education network access to A project on each node USES many Fiberstore CWDM system equipment. In this scenario, A computer room – B node transfer 2 10/100 MBPS data signals and A cable TV signal, which is based on WDM CWDM access, two 10/100 MBPS signals after Fiberstore C5002S through Fiberstore HA – WDM multiplexer, and cable television signals and reuse all the way to A single fiber, transfer to the access point B region, middle transmission distance of 50 km, implements and Ethernet cable TV signal on the single fiber CWDM solution of hybrid transmission. 1.Save fiber resourcesCWDM (Coarse where division multiplexing) Coarse wavelength division multiplexing system, which USES optical multiplexer in the different optical fiber transmission wavelength multiplexing in a single fiber transmission;On the receiving end of A link, using wavelength multiplexer and then revert to the original wavelength, using optical fiber all the way, on the whole link is solved effectively under the condition of the optical fiber resources extremely nervous network access, this scenario, A, D, E, between transmission on A single fiber and four 10/100 MBPS (also can be 1000 MBPS) signal, A room – B node is in the original cable TV signal transmission on A single fiber loading 2 10/100 MBPS signals, save A lot of fiber resources. 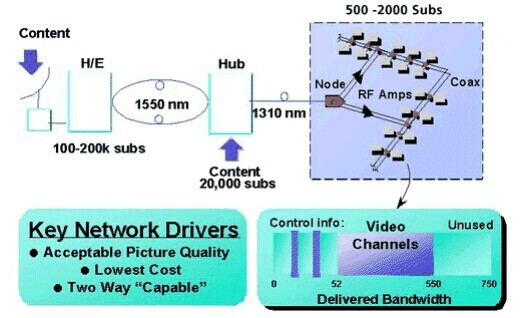 2.More business and high bandwidthCWDM is a according to the practical application to the transfer rate of adaptation based transmission platform, support a variety of business transfer.At each wavelength, the support of the business including 10 m / 100 m / 1000 m Ethernet, 155 m / 622 m / 2.5 G of SDH, 155 m / 622 m ATM business, as well as the Fiber Channel business, and so on.The whole system capacity to play a few Gbps data signal.Fully meet user bandwidth requirements in quite some time.This scenario USES is 10/100 MBPS business with cable TV signal for hybrid transmission. CWDM system than the price of DWDM Multiplexer is relatively low, due to the power of CWDM is small, small volume, easy to use, thus supporting facilities, personnel training and the late maintenance cost is low.Compared with optical cable project: using CWDM device is opened rapidly, low cost, convenient network upgrades, late and increasing need of signal directly, or replace the higher rate of product, don’t need to change the fiber link, convenient network upgrades, reduces the network upgrade costs.The above scenario A-D-E, if change into 1000 MBPS data signals, the capacity of the network directly to upgrade to the 4 GBPS. This entry was posted in WDM Optical Network and tagged DWDM Multiplexer, DWDM MUX DEMUX, DWDM MUX price, DWDM OADM on June 14, 2014 by Admin.